As you are no doubt aware we have encouraged all of you to share with us your love of Frank Black and Millennium and we have been delighted by the response. For many, Millennium is more than just a television show, it has become an indelible part of their lives, quite literally. 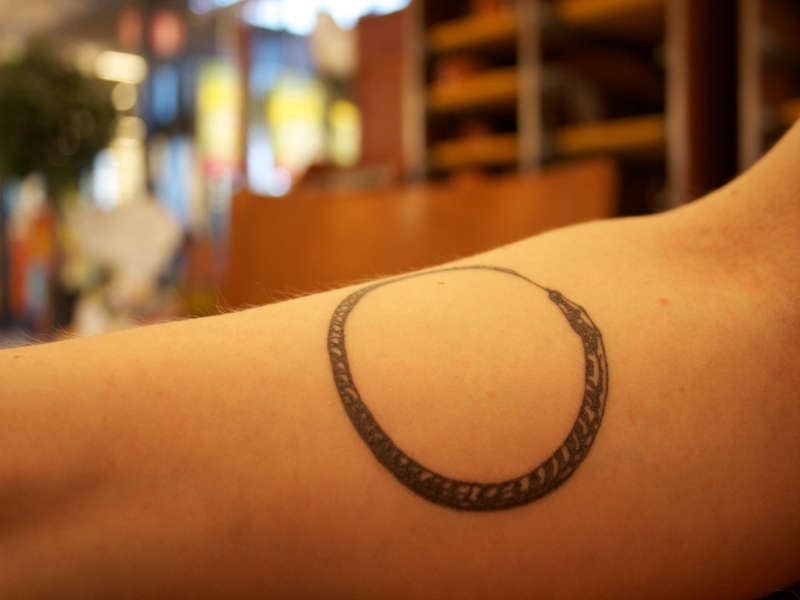 One such fan, Markus, wrote to us recently and shared his thoughts on Millennium and his praise for the campaign and treated us to a picture of his ouroboros tattoo, the arcane symbol of The Millennium Group now permanently a part of his life. We know that ouroboros tattoos are something of a craze amongst ardent supporters of the franchise, having seen a number of htem over years, so if you have joined the ranks of the 'inked' don't hesitate in sharing your pictures or experiences with us. That said, our thanks to Markus for allowing us to share this picture with you all and keep your eyes open for more exclusives, including another interview with the cast, this week! 5 Responses to "MORE THAN SKIN DEEP"
It's really well done! I've wanted one like this since I first discovered Millennium. It is such a meaningful symbol (both in relation to the show and in a larger context). In fact, I wanted either that or the "we're running toward an apocalypse of our own creation" Chinese symbols. But as I grew older, I realized Chinese tattoos may be a little bit too common. P.S. I still can't believe those two little symbols have such a long meaning. A great tattoo. I'm a great admirer of people who are prepared to suffer for their art, not sure I have their fortitude but if I opted for another tat (one was enough) it would, most certainly, be MM inspired. I could live with that Tattoo! If I could cope with the needle >< I'm squeamish!